The compilation of a field guide presents several difficulties. If it is too long, accounts of rocks or rock suites tend to be diffi­cult to find and the price is too high; and yet, if certain rock types are left out, the guide will fail in its purpose. Therefore I have tried, with the help of my co-authors, to follow an intermediate course: each rock type is dealt with and extended descriptions are given of those rocks which have received attention from research workers in the recent past. Recent ideas on the form and structure of Tertiary igneous centres have been included and an attempt made to outline some of the problems still requiring solution. In the excursion descriptions we have tried to make these as detailed as possible both in location finding and geology, so that the geology can be followed in the field with reasonable ease. I wish to thank my co-authors, Eric Durrance and Nick Walsh, for their splendid accounts of centres 2 and 3 respectively; and also for trying to follow my many and mostly incomprehensible instructions. 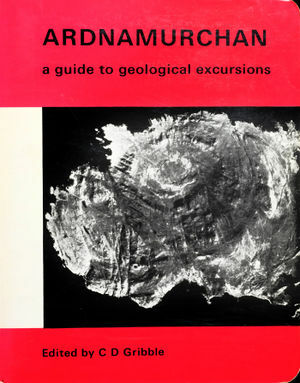 My thanks to the Edinburgh Geological Society for continuing to produce an Ardnamurchan guide, and especially to Norman Butcher and Walter Mykura of the Society for their help in many aspects of the organisation. I am grateful to the Assistant Director of the Institute of Geological Sciences, Edinburgh, for permission to use many of Richey's diagrams, and particularly to Robert Ramsay of the IGS for drawing the marvellous colour map and all the diagrams in the text. The map is based on Crown Copyright Geological Survey maps, repro­duced by permission of the controller of Her Majesty's Stationery Office*. I am also grateful to Ian Vann and Kenneth MacDonald for contributing the sections on dykes and Ardnamurchan place names respectively, Walter Mykura who helped referee the original text, and Michael Keen for his assist­ance with the Mesozoic rocks. All of us thank the various secretaries involved, and particularly Dorothy Oliver who typed the final, complete manuscript. We all acknowledge financial assistance from our respective universities, Glasgow, Exeter and King's College (Central Research Fund), which supported the fieldwork required in the preparation of this guide. Finally, I should like to thank the Carnegie Trust for a substantial grant towards publication costs of the coloured map. Topographical base map © Crown Copyright 83692M08/96. Users of this guide in the field are requested to always bear in mind the various points made in the Code of Geological Fieldwork issued by the Geologists' Association. Copies of this code are available from the Geologists' Association, Burlington House, Piccadilly, London W1V 9AG. The Ardnamurchan Peninsula is still unspoiled and a geologist can get access to most parts of it relatively easily, but it is only common courtesy to ensure that landowners are informed and their permission sought when walking onto land, particularly the area around Loch Mudle, which used to be owned by General Accident and is now owned by a private individual. Organisers of field parties should note that the Ardnamurchan roads are generally unsuitable for large coaches, and that minibuses will provide a better method of transportation. Travellers to Ardnamurchan intending to cross Loch Linnhe by means of the Corran Ferry should check the ferry times in advance. The road via Glenfinnan, Loch Ailort and Acharacle provides a good alternative approach. Very few research papers have been published during the last twenty years on aspects of the Tertiary geology of Ardnamurchan, but a very large number have been published on the age of igneous episodes across the entire Tertiary igneous province. I have therefore amended Table 1 on page 7 and have added the following comments on the age determinations and on the most recent ideas and views on the Tertiary Province. I have also added a list of references to work published since 1976. The initial opening of the North Atlantic Ocean occurred during early Mesozoic times, and this was followed by the split­ting of the Greenland Plate from the West European Plate in late Cretaceous times. Volcanism began in this structural environ­ment in the latest Mesozoic, but continued into the Tertiary when the greatest activity took place (Upton 1988). Subsidence and faulting during the Palaeocene gave rise to the controls respon­sible for early dyke emplacement and lava extrusion (the Tertiary plateau basaltic lavas). The distribution of these thick sequences of lavas was probably dependent upon where the Mesozoic sedimentary basins were sited. Later in the Palaeocene, central subvolcanic complexes (such as those in Mull, Skye and Ardnamurchan) were mostly sited in areas of thick, pre-Mesozoic, uplifted crust, where crustal thin­ning was not an important factor, as it had been in the location of the major dyke swarms. Walker (1975) suggested that intrusions of granite diapirs preceded the development of these central complexes, but the sequence of events is often much more complicated (England 1990). Many central complexes are located at the intersections of major NE-trending faults with Tertiary dyke swarms, which had acted as fissure feeders to the lava piles. More detailed accounts of Tertiary igneous activity are given by Emeleus (1982, 1991) and Emeleus and Gyopari (1992). The entire Tertiary igneous episode occurred over a short period of time (see Emeleus and Gyopari 1992). Although varia­tions do occur in the sequence of igneous events, Table 1 represents a reasonably accurate consensus of the available data (Mussett et al. 1988; Hitchen and Ritchie 1993). In Scotland the total span of igneous activity was 11 million years, with the earliest dates of 63 Ma representing the lavas of Muck and Eigg. The Rum Central Complex was probably the next event as it post-dates the lavas of Eigg and Muck, representatives of which are incorporated in the zone of ring faults bounding the complex, but it predates the Skye lava field, since clasts derived from the Rum Central Complex occur in conglomerates incorporated in the Skye lavas (Emeleus in press). The two main lava fields of Skye and Mull have been dated radiometrically around 61 to 60 Ma, but recent palynological data suggests that the lavas of Mull are significantly younger than those of Skye (Jolley in press). The Ardnamurchan lavas are currently regarded as part of the Mull field. In Skye and Mull the latest dates of 54 Ma are shown by dolerite dykes, but the pitchstones of the Sgurr of Eigg, dated at 52 Ma, may represent the last event of all (Dicken and Jones 1983). Ardnamurchan shows a protracted set of dates, with the lava flows giving dates comparable with the Mull lavas and all intrusions (ring dykes, cone sheets etc.) showing dates of around 60 Ma to 58 Ma. These agree with the palaeomagnetic evidence which suggests that the igneous complex of Ardnamurchan developed rapidly. Around 61 million years ago early lava flows were extruded onto a landscape carved out of Precambrian metasedimentary rocks (the Moine `schists') with a thin cover of Mesozoic sedi­mentary rocks. Vents and asociated volcanic rocks accompanied this activity. Ring intrusions were emplaced in the volcanic 'root zone' with the focus of activity moving slightly from west to east dur­ing this period (60 to 56 million years ago). During this period, between 59 and 58 million years ago, an early set of steeply dip­ping inner cone sheets was intruded in the west. The outer cone sheets were emplaced at the end of the igneous episode (around 56 million years ago). Dolerite dykes were emplaced throughout the igneous episode and igneous activity ended with a final phase of dyke intrusion. The sequence of events given above probably accommodates all the facts and data that have become available since 1930. Nevertheless, the classification of Richey et al. (1930), based upon three centres of igneous activity, which was adopted in the original preparation of this guide (page 8), remains a valid and practical approach for descriptive purposes. Day, S.J. 1989. The geology of the hypersthene gabbro of Ardnamurchan Point and implications for its evolution as an upper crustal basic magma 'chamber. Ph.D. Thesis Univ. Durham (unpubl.). Dickin, A.P. and Jones, N.W. 1983. Isotopic evidence for the age and origin of pitchstones and felsites, Isle of Eigg, N.W. Scotland. Jl geol Soc. Lond. 140, 691-700. Emeleus, C.H. 1982. The central complexes. 369-414 in Sutherland, D.S. (editor), Igneous rocks of the British Isles (Chichester: Wiley). Emeleus, C.H. 1991. Tertiary igneous activity. 455-502 in Craig, G.Y. (editor), Geology of Scotland (3rd edition). (London: the Geological Society). Emeleus, C.H. Geology of Rum and the adjacent islands. Mem. Br. Geol. Surv., Sheet 60 (Scotland). Emeleus, C.H. and Gyopari, M.C. 1992. Geological Conservation Review Series: Volume 4, British Tertiary Volcanic Province. (London: Chapman and Hall, for Joint Nature Conservation Committee). England, R.W. 1990. The identification of granite diapirs. JI geol. Soc. Lond. 147, 931-934. Hitchen, K. and Ritchie, J.D. 1993. New K-Ar ages, and a pro­visional chronology, for the offshore part of the British Tertiary Igneous Province. Scott. J. Geol. 29, 73-85. Jolley, D.W. in press. Palaeosurface palynofloras of the Skye Lava Field and the age of the British Tertiary Volcanic Province. in Widdowson, M. (editor), Palaeosurfaces; recog­nition, reconstruction and interpretation. Geol. Soc. Spec. Publ. Mussett, A.E.,-Dagley, P. and Skelhorn, R.R. 1988. Time and duration of activity in the British Tertiary Igneous Province. in . Morton, A.C. and Parson, L.M. (editors), Early Tertiary Volcanism and the opening of the NE Atlantic. Geol. Soc. Lond. Spec. Publ. 39, 337-348. Upton, B.G.J. 1988. History of Tertiary igneous activity in the N. Atlantic borderlands. in Morton, A.C. and Parson, L.M. (editors), Early Tertiary Volcanism and the opening of the NE Atlantic. Geol. Soc. Lond. Spec. Publ. 39, 3-14. Vogel, T.A. 1982. Magma mixing in the acidic-basic complex of Ardnamurchan: implications on the evolution of shallow magma chambers. Contr. Mineral. Petrol. 79, 411-423. Vogel, T.A., Younker, L.W., Wilband, J.T. and Kampmueller, E. 1984. Magma mixing: the Marsco Suite, Isle of Skye, Scotland. Contr. Mineral. Petrol. 87, 231-241. This page was last modified on 14 December 2015, at 00:30.